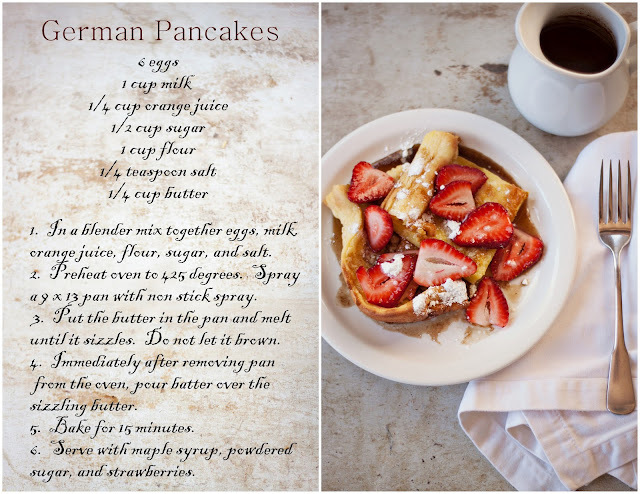 Mustard Me Yellow: German Pancakes with Strawberries and Maple Syrup. 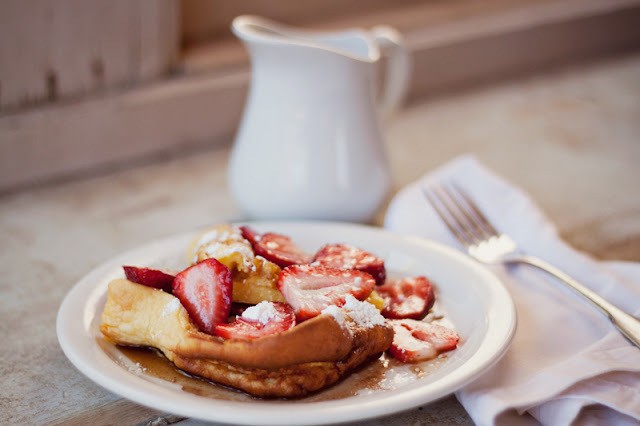 German Pancakes with Strawberries and Maple Syrup. (Recipe adapted from YESTERDAY ON TUESDAY). Get excited because I'm going to share with you our family's recipe for homemade maple syrup. Once you try it you'll never be able to eat store bought maple syrup again. This recipe was created by my brother-in-law, Brandon, while he was on his MISSION in France. It's crazy good. Combine all ingredients in a medium saucepan. Stir on low to medium heat until butter is completely melted and all ingredients are dissolved. Serve warm! Enjoy! mmmmm! I love german pancakes, I have never tried it with orange juice in it though. I will have to give it a try. My recipe is melt 2 tbsp. butter. Mix together 6 eggs, 1 cup flour, 1 cup milk, 1 tbsp brown sugar and 1 tsp salt. thank you so much for sharing! I'm so excited to try this! looks delish! love these photos too! your photos are gorgeous! and this looks delicious. what camera and lens do you use?